During the rest of the year, the organizers of the event, the Benchmark Institute, helps develop better quality legal services to low-income communities. With an office in San Francisco’s Mission District and with a potent blend of inspiration and hard work, their staff have proved tamales to be as unifying as they are fortifying. I can still remember the first time I succumbed, one sunny day on a San Francisco sidewalk, to the low and furtive murmur of “hot tamales, hot tamales.” Without a word, I followed a man to a minivan parked at the curb. Inside, his wife and teenaged daughter dug into their secret stash, kept warmly bundled inside 5-gallon buckets covered with thick towels. One pork, one chicken. I found a fire hydrant to lean on and ate both tamales straight out of the plastic. That red minivan still appears in my dreams. 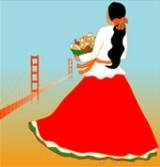 So with much excitement, I’m heading to the Taste of Tamales festival. A wide variety of vendors will offer tamales and other tamale-friendly treats, such as hand-fried plantain chips by Estrellita’s Snacks, heritage beans both cooked and uncooked from Rancho Gordo, and coffee by Mama Art Cafe. In between all the tasting, you can browse gifts like colorful tile paintings from Suha Suha Studio or books new and old on Mexican and Southwestern cooking from Omnivore Books. The margarita competition should be as fun to watch as taste. Family-friendly events include storytelling sessions and a tamale-making demonstration. Those fascinated by how cuisines crossed the oceans can stop by the stage for my presentation, South By Southeast Asia: Tamales in the Philippines and Guam. Filipinos sailors manned the first Spanish ships that landed on our coast, while the Manila-Acapulco galleons directly connected Mexico to Asia long before California even appeared on maps. I’ll be showing how corn deliciousness wrapped inside a leaf moved and morphed across 7,000 islands in Southeast Asia to mash up in Manila with its Chinese counterpart. Along with cheese and pork, peanuts and coconut milk made their way into the post-colonial tamal. For the first couple of hundred who arrive at the talk, there’ll be tastings of these unique versions of tamales still enjoyed in the far-reaching Pacific archipelago. A detailed schedule will be posted soon. In the meantime, mark your calendars for the last Sunday in April. You might want to skip breakfast that day. Buchanan St. at Marina Blvd.